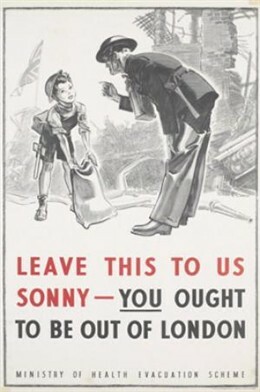 At the start of World War II around one million children were evacuated from their homes in London and from other British cities. The British government referred to the evacuation as “the biggest exodus since Moses.” The government ordered “Evacuate Forthwith” on 31 August 1939 and the children began their journeys the following day. In London alone there were 68 designated departure points. Just a short while later, Buckingham Gate School arrives at 12.35. KB notes that one in four mothers are crying and that all the parents look tired. Between the summer heat and stress of the day, everyone is very hot. It is impossible to come up with a comparable situation of the day to describe the atmosphere on the platforms. The striking contrast between the ordinary attitude of the children juxtaposed with that of the emotions of the parents is awkward to say the least. Stuck between the two attitudes is the calm of the schoolteachers and the police. When the expected raids didn’t happen, children returned home. After the “Phoney War" (September 1939 to April 1940) nearly half the children originally evacuated returned. This page was added by Sarah Boyle on 13/08/2011.